High on my children’s list of thrills is receiving a letter in the post. I can relate – I approach the letterbox each day with pleasant anticipation, despite the fact that most times the mail is boring bank statements or yucky bills. Now there is something worth racing to the letterbox for. A little over a year ago, Anna and Tess Knoebel launched Abe’s Penny, a ‘micro’ magazine published in the form of postcard instalments – each weekly issue features a story told in image and text with various artists and writers collaborating on different stories. The Knoebels liked that readers could finish a card in the time it takes to walk from their mailbox to their front door. They also liked the history associated with mail delivery and recognized that email had fewer people writing letters. Since publishing Abe’s Penny, they found that mail has a huge support system, almost a cult following. Now the Knoebels are sharing the joy with children. Abe’s Peanut launches in June and follows the same successful concept as Abe’s Penny. 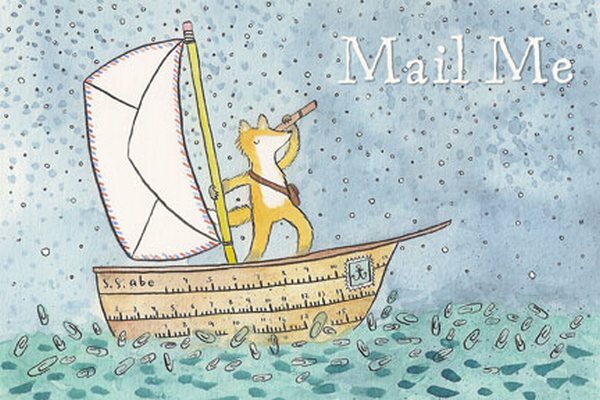 Children receive a postcard in the mail each week and the story gradually unfolds. The postcards will feature illustrations, drawings, paintings, connect-the-dots and other imagery that appeals to children. A different artist and writer will collaborate on each issue. Volume One features illustrations by Vanessa Boer and a story by Lisa Tharpe. Abe’s Peanut delivers to Australia. A six month subscription is US$60 – a small price to pay for the fun, anticipation and collectible art that it will deliver. We’re standing by our letterbox!